We looked at 777 Million Facebook posts to find the most engaging pages, brands, and videos for 2018. Facebook reach continues to drop across the board for businesses. Everyone is clamoring to unlock the “secrets” to successful content on Facebook. Study after study has proven that one of the most significant factors in Facebook’s ranking algorithm is engagement. If your Facebook posts get more engagement, they’re going to be more highly favored in the algorithm, thereby increasing your reach. Increased organic reach means you have to spend fewer ad dollars to reach your target audience. So how can you craft posts that generate engagement? In this article, we’ll reveal our findings and then give you some actionable steps to gather insights specific to your business. Below you’ll find the highlights of our data analysis. Each section is broken down by some of the most important questions marketers have been asking about Facebook engagement. As with previous years, the most engaging type of Facebook post in 2018 is video. It’s not even a close call — video dominates based on average engagement rate. Video dominance isn’t surprising, says Jenn Hermann, award-winning Instagram blogger at Jenn’s Trends. “At the beginning of 2018, Facebook announced they wanted to focus on ‘meaningful interactions.’ And video, when viewed for any significant duration of time, is considered to be meaningful,” Jenn says. You can see that engagement clearly below. It’s clear that if you want the greatest potential Facebook engagement, you should be investing in video content. We will talk in more depth about video later in this article. (You can skip to it right now if you’d like). If you are overwhelmed by the thought of creating video for Facebook, it’s good to remember that engagement is the goal, not necessarily quantity. Mari Smith, Facebook Marketing Expert, makes a strong case for thinking on multiple levels about engagement. When thinking about images, keep in mind that sizing them correctly for each network is a key part of the process. This guide can help! It has everything you need for sizing images for different parts of Facebook and other social networks. Now, most marketers know that this question is a tough one to generalize. Every target audience is different, and therefore these global numbers may not work for you. However, it doesn’t hurt to look at them and use them as a starting point if you have no other data. Another option for narrowing the times that are most successful in your industry is to find the times that your competitors get the most engagement. The Facebook Analyzer let’s you search by page and see peak engagement as well as useful details about post frequency. 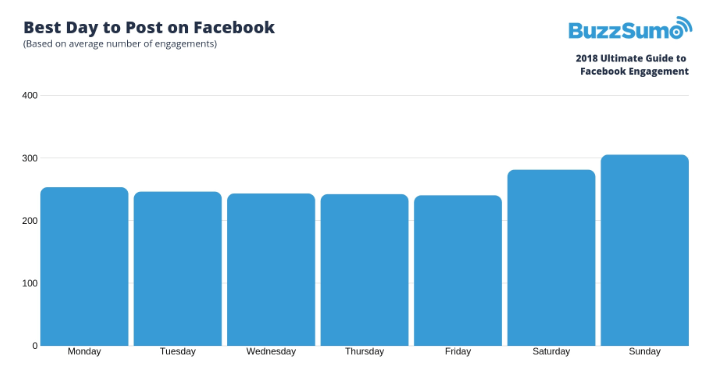 Analysis of Hubspot Facebook Page engagement by time of day. Again, this may differ depending on your audience. However, the results could show why your Friday posts haven’t been performing as well as your Monday posts. 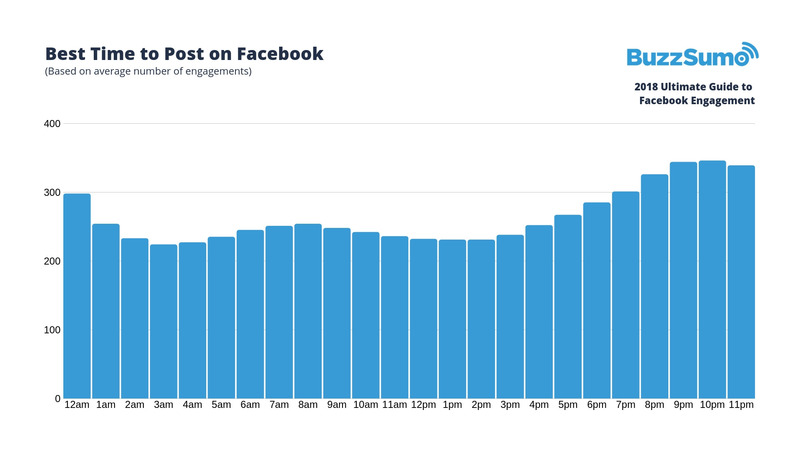 According to this data, Sunday is the best day to post for Facebook Engagement. Many businesses take the weekends off and therefore may be choosing to only post Monday through Friday. According to our data, that might be a mistake! Perhaps try taking one of your scheduled Thursday or Friday posts and moving them to Saturday and Sunday to see how they perform. You might be surprised at how well they do! 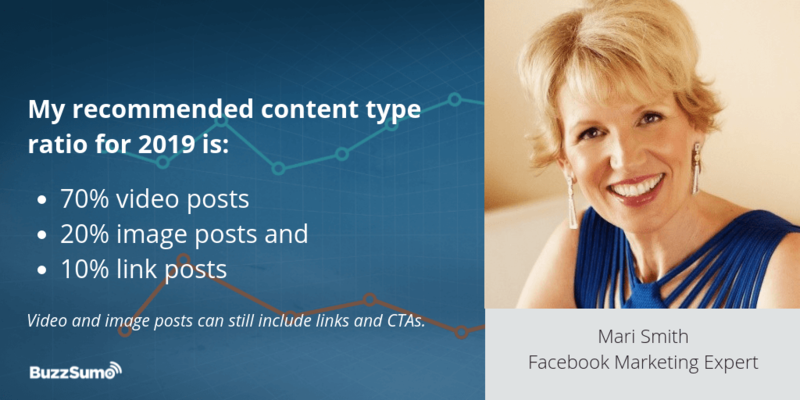 We all know that long-form content is king when it comes to SEO, but it’s quite the opposite when it comes to Facebook. Brevity is the clear winner for Facebook posts. If you want the best chance of engagement, keep your Facebook posts no longer than 50 characters. This makes sense — Facebook consumption is extremely passive, and attention spans are short. You need to be able to grab people’s attention quickly and effectively if you want to be noticed. And, as always, test these general findings with your specific audience and industry. With Facebook’s big push on video content this past year, we wanted to have a breakdown of insights gleaned from the top performing videos of 2018. We’ve analyzed everything from video length, average interactions, most common interactions, and performance of video vs. other formats. 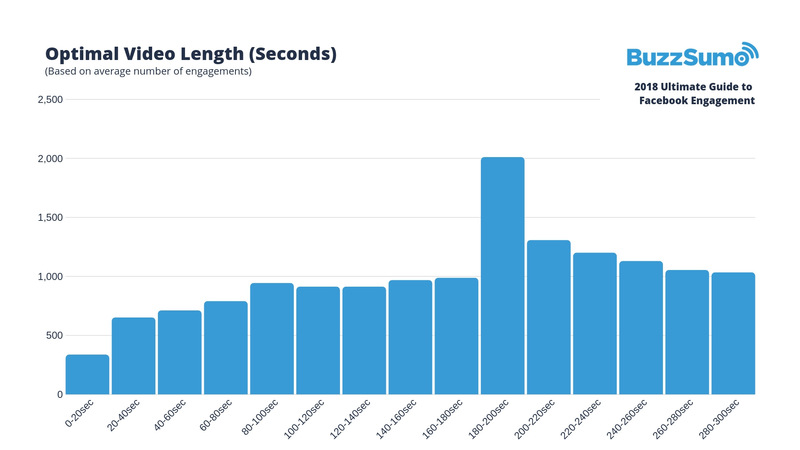 Facebook’s maximum video length is 240 Minutes (4hrs), with a max file size of 4 GB. However, that doesn’t necessarily mean you need to produce videos that long. 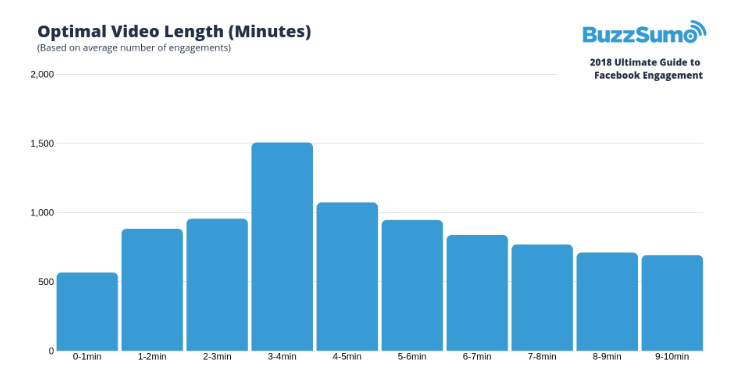 Our data shows that the optimal length of a Facebook video is between 3 and 5 minutes. Now, it’s worth noting that if you break it down in 20-second intervals (yes, we love data that much) you can see a significant spike in the 180-200 second range (3:00-3:20 minutes). The average engagement jumps from 986 to 2,009! If your video is longer than three minutes, make sure that you include CTA’s and brand identification early, before the four-minute mark. “Shorter, more frequent bits of video content is how consumers prefer to share with each other. No wonder that Facebook encourages us as marketers to do the same,” says Dennis Yu, of Blitzmetrics. 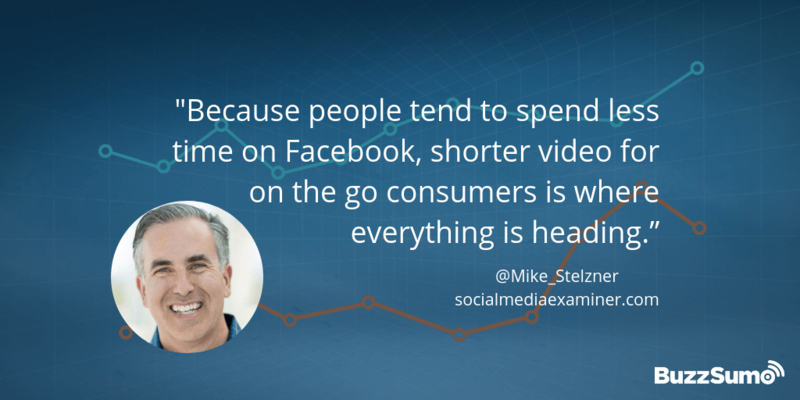 Michael Stelzner from Social Media Examiner tied the same concept toward the trend to spend less time on Facebook. Want even more impact from your video posts? “15-second vertical video is killer since it doesn’t look like an ad,” Dennis says. The reaction from Facebook users to different videos provides great insight for brands who want to create engaging content. Love, as it turns out, is the most powerful emotion, driving 46% of reactions. Second to love is the “HaHa” reaction, which would coincide with the success of humorous videos circulating. What motivates people to engage with a Facebook post? The range of emotional reactions to Facebook video makes sense when you think about the nature of Facebook. It’s a platform where people connect with their family and friends, often around shared interests. The key to Facebook engagement in any marketing strategy is to focus on offering value. Mari Smith suggests that the goal should be to “Edutain” your audience — teaching them something useful, something that relates to a niche in which you are an expert, and to do it in an enjoyable way. It can be easy for us to slip into our marketer mode when we plan Facebook posts for our brands. But, keeping our consumer preferences in mind is a powerful way to ensure our posts are engaging. Look at your own Facebook home page. What did you share in the last three months? If you are like me, you will find personal memories and life events. And, an occasional funny or helpful link from a brand. If you are like my husband, you will find personal memories and life events, with an occasional funny or helpful link AND an occasional link to a political editorial. For marketers, a well-developed strategy for Facebook engagement will include posts of many different types, with various purposes. Ideally, your Facebook strategy will be fully integrated with your marketing plan, not just a separate project with unrelated goals. In other words, you don’t want to post just to get a bigger Facebook audience. A bigger Facebook audience needs to fit into your overall marketing plan. For example, you could plan to nurture your Facebook audience to subscribe to your email list, visit your site, try your product, etc. Calls-to-action help clarify for your audience what the next step should be. They invite the audience to move closer to your goal for them. 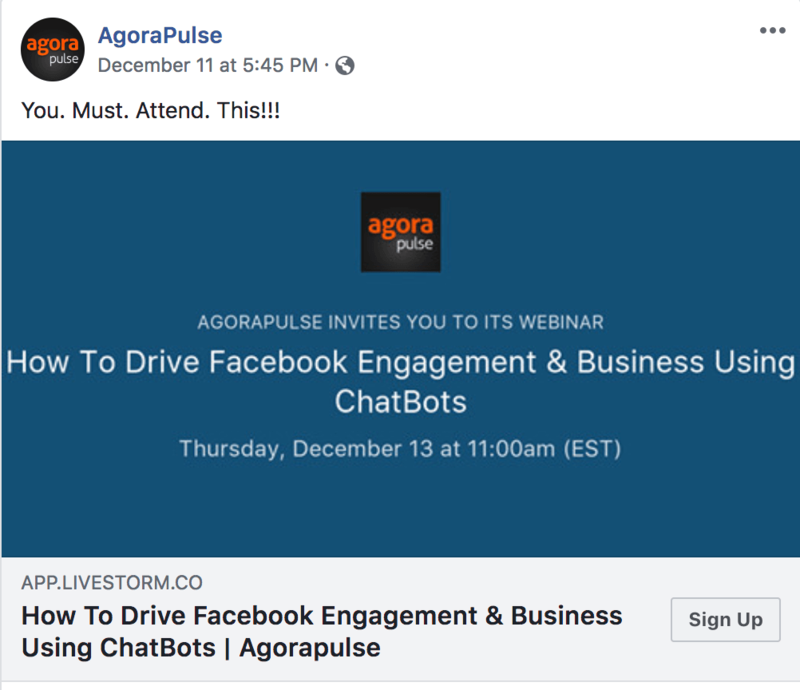 Here’s an explicit call to action from AgoraPulse. It uses the Sign Up button available from Facebook. 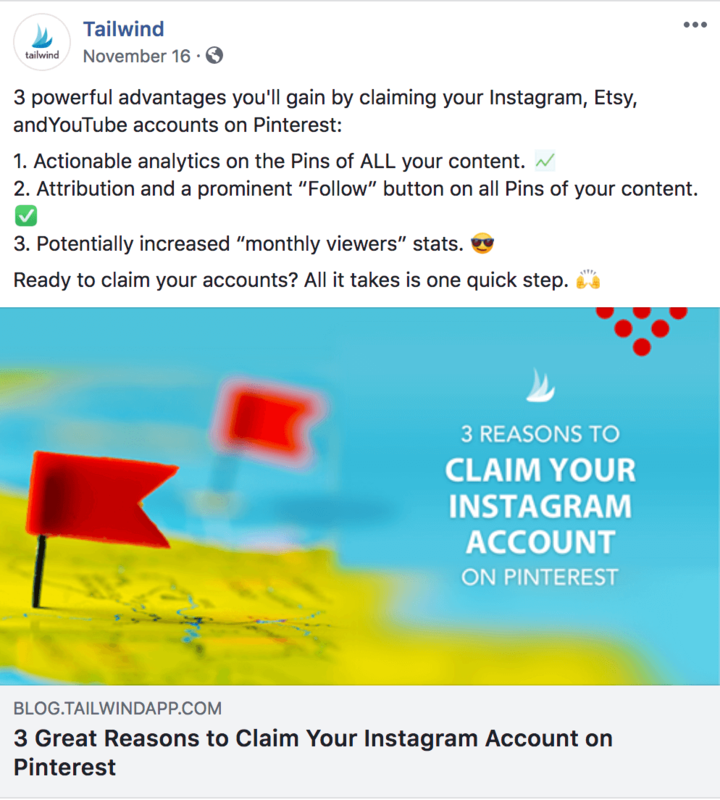 And, this post from TailwindApp offers value by suggesting that three types of accounts should (and can be) claimed on Pinterest. The Call to Action doesn’t need to be any more explicit here because the post itself builds a case for clicking the link. Audience nurture for Facebook engagement should also include posts that are simply helpful. You don’t want to exhaust people with endless asks for more of their time, attention, or money. 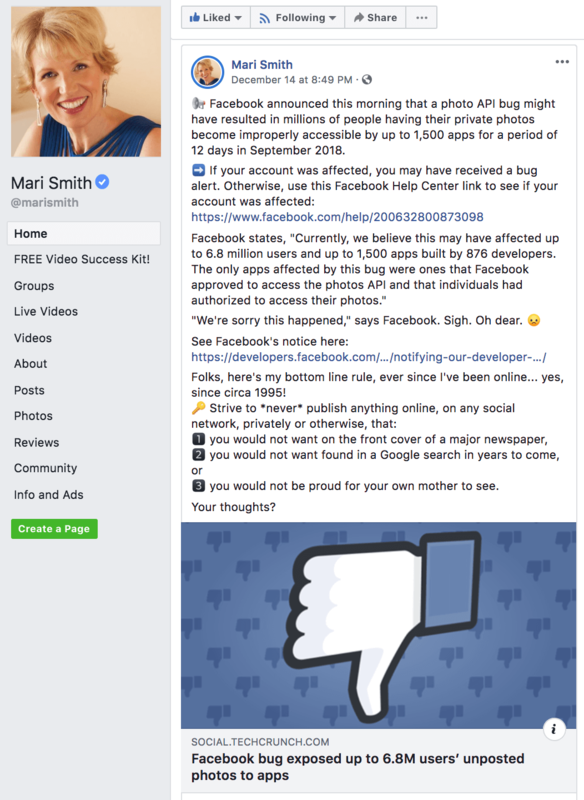 Here’s an example from Mari Smith’s Facebook page. She posted about a Facebook security breach that may have allowed unauthorized access to photos from timelines, and she includes some great advice the types of pictures to avoid posting online. 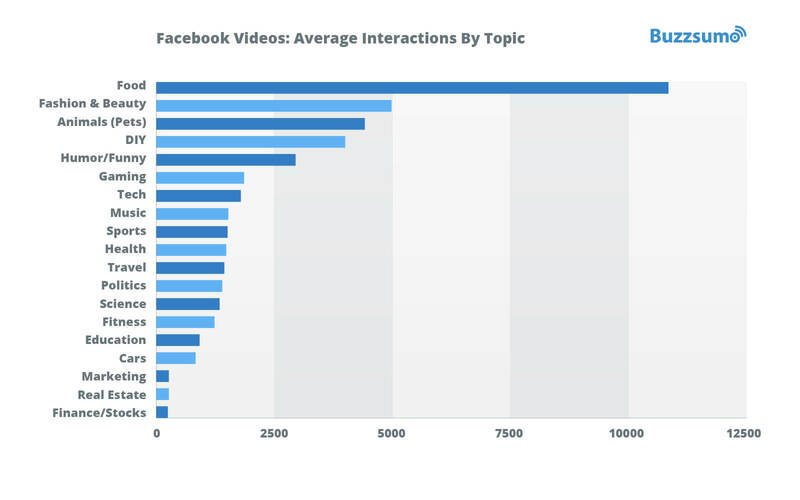 In an earlier study, we looked at 100 million video posts, to find the most engaging topics. These topics are still well represented in the top video posts of the year. So what pages, businesses, and brands generated the most engagement in 2018? We looked at the top 500 posts and live videos from this year, and the following pages had the most appearances throughout the list. 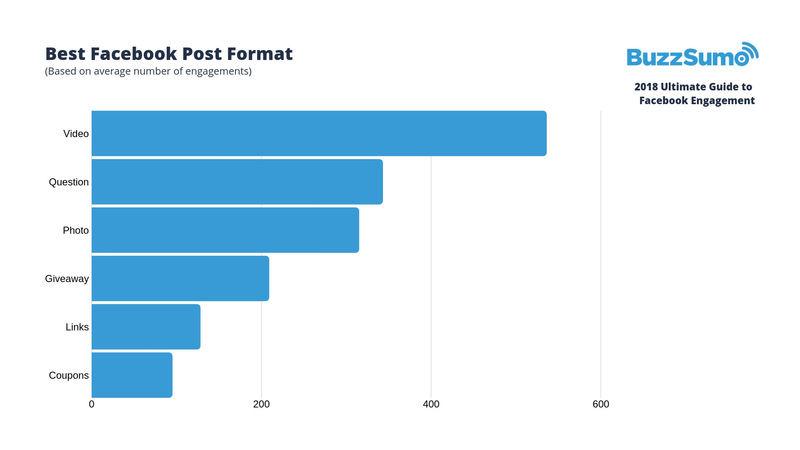 The top 500 posts we’ve analyzed here represent nearly 1 Billion total engagements in 2018. We’ve included some commentary to help make this list more actionable for pages of all types. 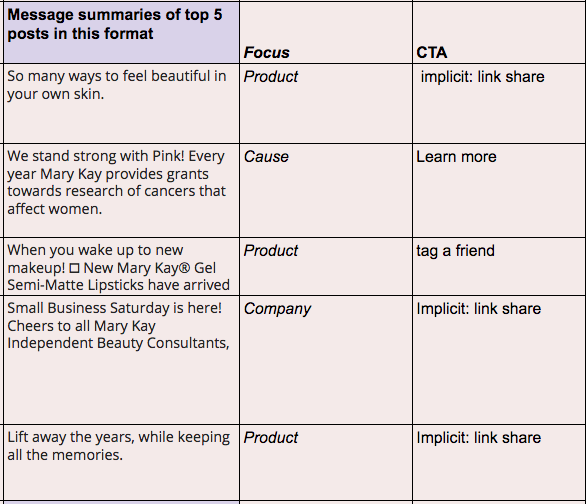 Buffer has a great analysis of additional influential Facebook pages. First on the list is Strive Masiyiwa, a Public Figure, who managed to get 34 posts in the top 500. The total engagements across all posts were a whopping 63,142,841. Masiyiwa is the CEO of EconetWireless and a philanthropist. His posts provide a great example of how a C-suite level executive can create Facebook engagement. People share content to raise awareness about an issue. Coming in second was the Funniest Family Moments page–a purely entertainment driven page. The page managed to have 22 posts in the top 500, garnering a total of 51,546,121 total engagements. This page also features babies and animals in many of its posts. Most marketers won’t be able to focus on making only funny videos, but the success of this page is a powerful reminder to keep entertainment in mind as you craft your Facebook posts. Next up was Facebook Watch page Jay Shetty whose posts appeared 12 times in the top 500. These posts (all video) totaled up to 32,274,622 engagements. Jay’s posts align very clearly with the idea of sharing for self-fulfillment, as well as to foster relationships and share helpful information about building relationships. Some of his more successful posts are over the top emotion-grabbing mini-narratives. To apply this tactic outside of a self-help arena, remember that audiences want to connect on an emotional level. Often our stories provide a business-friendly way to do that. She describes a serious life event — losing her job — raises the emotional stakes by talking about her young child and traces her path forward; offering inspiration for others in a similar situation. The Dodo — a media publisher — appeared on the list 12 times also, gathering up 21,783,203 total engagements. Given Facebook users’ preference for videos about animals, it’s not surprising that the Dodo’s 4005 animal-centric, heartwarming posts this year have performed well. Coming up next on this list was People Are Awesome with 9 appearances yet a very close total number of engagements to the previous page. People Are Awesome’s posts totaled 21,061,836 engagements. First Media Blossom was next on the list 9 times as well. They garnered less engagement, however, with 18,628,714. The focus of the page is clever DIY and life hacks. Even if our businesses have nothing to do with lifestyle or decor, we can take advantage of our audience’s desire to learn new things or simplify complex tasks and boost our Facebook engagement in the process. Consider a step-by-step breakdown of a process that solves a problem for your audience. To encourage Facebook engagement, ask yourself if you can “show” your audience something, instead of simply “telling” them something. For example, in this post, Aaron Orendorff teaches his audience a lot about an effective welcome letter. But, he does it with an engaging show and tell approach. Everyone’s favorite Prince of Bel Air, Will Smith came in next on the list with 7 total appearances in the top 500 Facebook posts. Total engagements across these posts were 10,805,104. Tying in appearances with Will Smith is the LADbible page — an entertainment site — with 7 appearances also. The total engagement across these appearances was very close at 10,774,847. Next on the list comes In The Know Innovation, a Facebook Watch page by AOL. They managed to make 6 appearances totaling 10,717,623 engagements. Last on our top 10 list was Food Media/Publishing site Twisted. This page managed to get 5 posts in the top 500 gathering a total of 8,805,122 engagements. One overwhelmingly clear lesson learned from observing these top pages and their posts was that video is king on Facebook. Out of all 10 of the pages mentioned above, 9/10 had a video as their most engaging post. Looking at all the posts from top pages, there is a small mix of image and text posts as well. However, video is the top format by a significant margin. 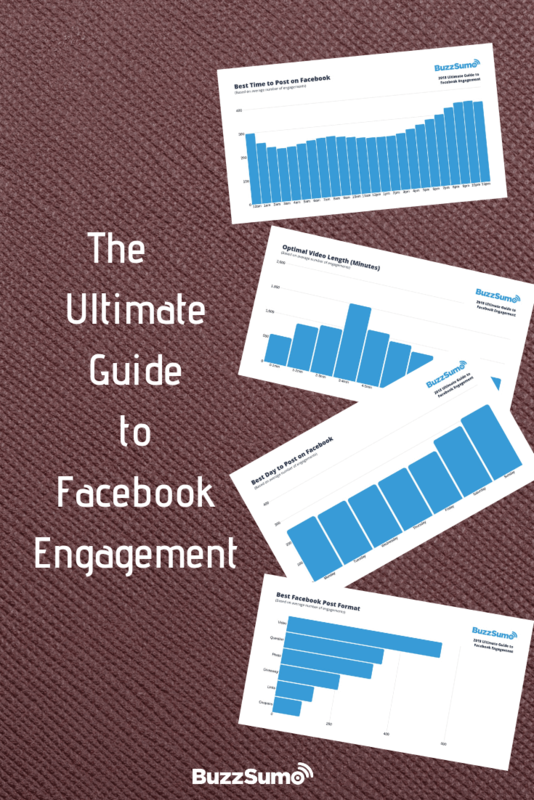 These pages also align well with the topics that people are most interested in engaging with on Facebook. And, they usually tap into the emotional reactions that people express most on Facebook. Now, all this analysis is great, but the one problem with it is that it’s so broad. As a business, you want to know how to analyze trends pertaining to your industry so you can use them to your advantage. To help you boost your reach on Facebook, we’ve come up with a six-step process to discover insight you can use. Actionable insight is the key to unlocking your organic (and paid) reach potential on Facebook. Here’s how to get it with BuzzSumo’s Facebook Analyzer. 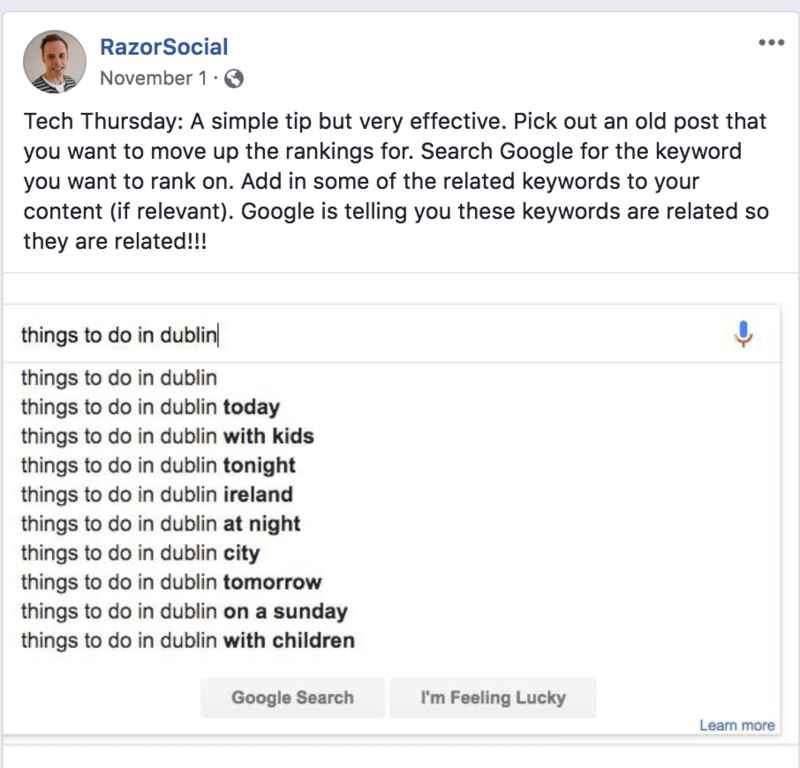 There are three categories of posts you should scrutinize: posts that relate to your industry and keywords; your competitors’ posts; and your posts. I’ve added a filter which limits my results to only those posts in English. BuzzSumo defines engagement based on the total of interactions (shares, likes, and comments), but there is also an option to filter by the type of engagement you are most interested in. The next step would probably be more accurately described as analysis, but I find it more helpful to approach the task as a set of questions. What do I see? How are the posts alike? How are they different? In this phase, I want to discover what, if anything, these successful posts have in common. In the “exams” search above, 2 of the top 5 posts are clearly looking to amuse audiences and the remaining three have more of an inspiring tone. Skimming the results is tempting. However, slowing down to notice creates big dividends. I looked carefully and found that posts about costumes, party foods, and holiday decor got the most engagement. That’s pretty much what you would expect for any holiday, however. So the information is not that helpful. Now, I can quickly identify two themes: DIY decorations, and close-ups of Halloween decor. 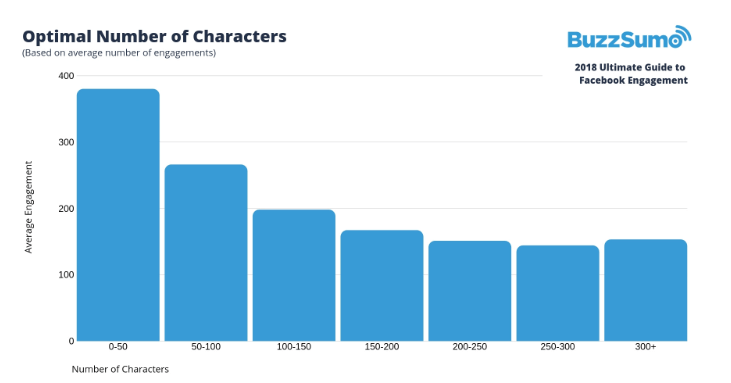 At a glance, BuzzSumo shows you the most popular type of post, the most popular post length in characters, and the day and time when people interacted most with posts about the topic. All of this is just an exercise in wasting time if I don’t draw some conclusions I can use. In other words, I need to apply the insights and test to see if they hold true for my audience. With exams, I can see that success stories engage the audience at a high level. 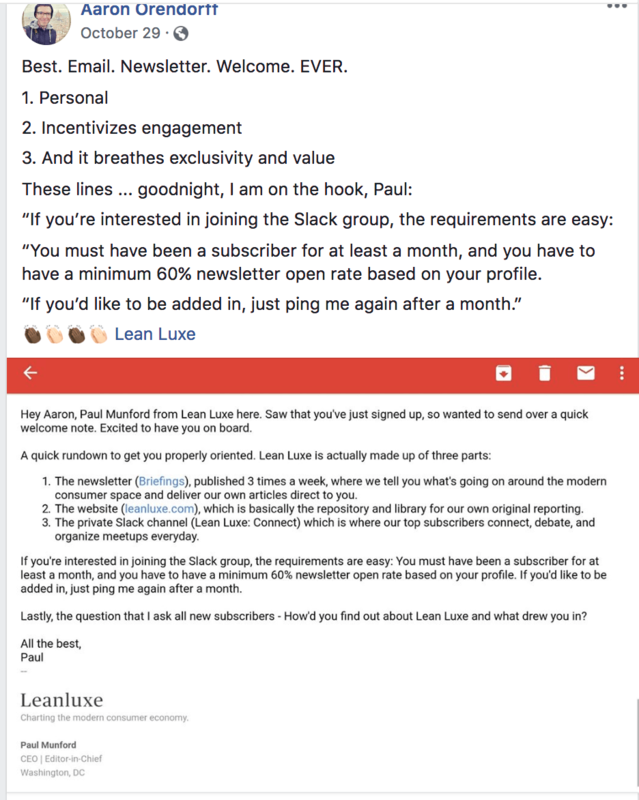 If I sell a product that helps people to study better, or offers revision resources, I can tap into a preference for inspiring content and post about the people who have used my product and succeeded. Data-driven insights tell us where to start. Continuous evaluation tells us how to proceed. BuzzSumo helps makes both tasks easier. Use data from the Facebook Analyzer to complement the insights available from Facebook for pages you manage. However, I also notice that some posts of others’ content show up in the results. We have high Facebook Engagement for a collaborative live broadcast and for a link to a comprehensive guide to SEO published by Brian Dean. Don’t be afraid to give away coveted Facebook real estate. Sometimes, promoting others is the best way to encourage audience growth, and it helps your followers realize that you aren’t just using their time and attention to promote yourself. Another great way to use the page search feature in BuzzSumo is to evaluate what is working for your competitors’ or industry leading pages. Unlike Facebook, BuzzSumo makes the same insights you can access for your own page available for your competitors’ pages. Knowing what works for them, analyzing that information to tease out actionable insights, and applying the principles to see if your audience responds is a best practice for competitor intelligence. Your research can be simple. Searching, asking, and making a note of the analysis provided by BuzzSumo for individual pages. 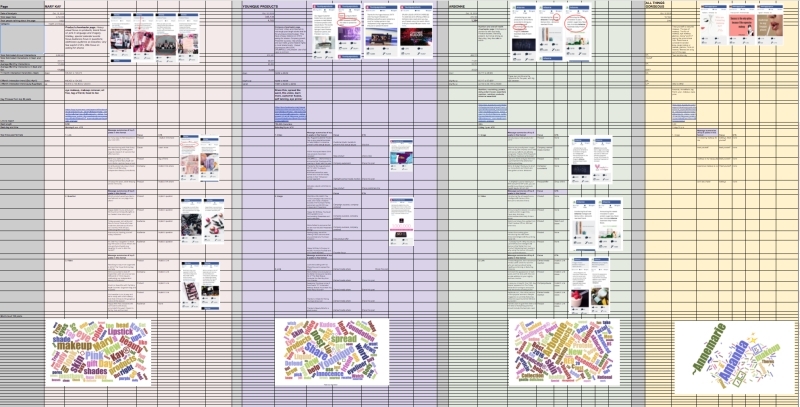 Alternatively, the research can be more complex, drawing comparisons between several competing pages and your page. 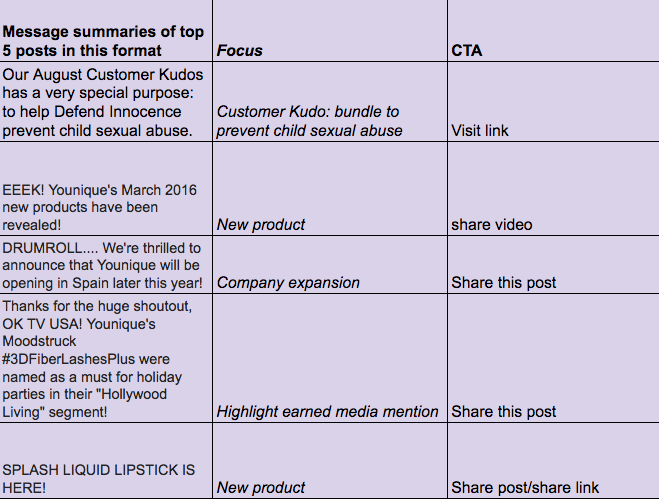 For example, This spreadsheet compares a new beauty industry passion page to other established beauty companies’ Facebook pages. I used data from BuzzSumo, along with a free word cloud and text analysis tool to determine the words and phrases used most often in the highly engaging posts. I also used BuzzSumo to determine the post categories that got the most interactions and evaluated each of them, asking myself what message they contained, what their focus was, and if there was a call to action. Categorizing the results helped me to see patterns and differences in emphasis for the pages. I used the BuzzSumo Analysis tool to find and compare interaction levels with the pages for different time periods. I also compared the best day and time for interactions with each company’s posts. At the end of the process, I was able to draw conclusions about each of the pages I studied. The interaction data confirmed that this is the strongest page of those I evaluated, and the summary gave me great insights I can use in developing my posting strategy. Because I was able to gather the same types of summaries for the other company pages, I can also target posts from the passion page to lookalike audiences that fit the style of my posts. None of this analysis was overly complicated. It just took an intentional effort to find relevant data, ask myself what the similarities and differences were, and make some strategic decisions based on those insights. The final step in the process is even more straightforward. If a particular insight drawn from your Facebook analysis doesn’t generate results for your audience, change it up. To be fair, it’s worth testing each type of post more than once, but if you consistently get poor results, don’t be afraid to change your strategy. Your own experiences form the next round of data available to you, and you can begin the Facebook analysis process again. In the coming year, we anticipate that we’ll continue to see heavy trends toward video content. Facebook has made it clear that they’re putting a lot of resources into its video platform. Although reports have shown low video retention that could change quickly if they attract more popular creators to create longer form videos. 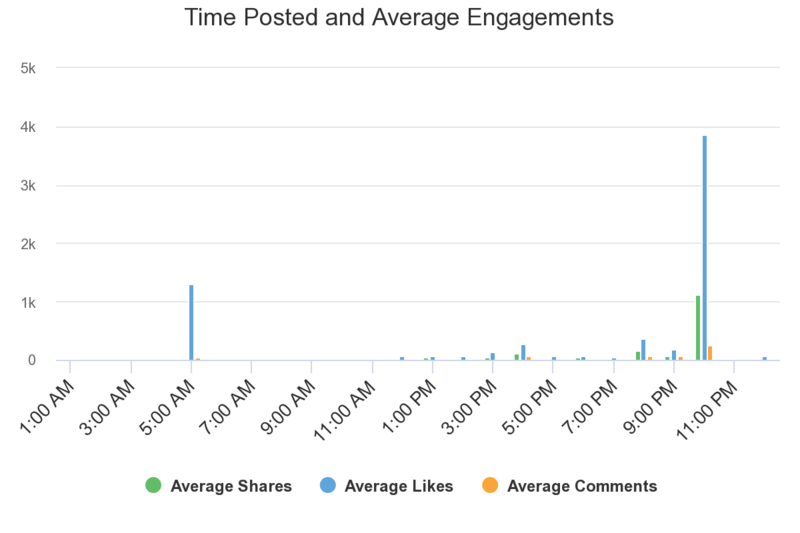 So take some time to do your own Facebook engagement analysis. Hopefully, our 6-step process makes it a bit easier for you to start taking action. Moreover, if you ever need any help utilizing BuzzSumo, don’t hesitate to reach out to our team. Do you have any predictions for 2019 and what it holds for Facebook engagement? We’d love to hear from you in the comments below.